If you are looking for a grader or a leveling blade for an excavator? Look no further with RSBaumaschinen you will be able to multitask with your excavator easily saving you several of hours or working time. Start digging and leveling out the ground with this excavator and attachment. Learn everything you can about the grader below. 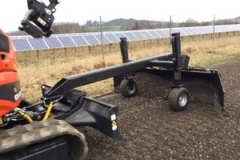 Mounting this grader to your excavator is a cost effective way to do several landscaping jobs without losing any of the power from the excavator. 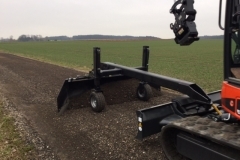 Once the blade has been mounted you will be able see the grader easily from the drivers seat for you will be able adjust the grader at the perfect height for any project. The basic width of the grader is 1.98 m (6.5 feet) and can be extended to 2.80 m (9.2 feet) via hydraulically adjustable side flaps. You will be able to adjust the grader properly inside the cab with a remote control. The grader GR01 leaves no streaks when making a fine plan of up to ± 1 mm because the wheels are located in front of the blade. The placement of the wheels creates a gap between the excavator and the grader blade offering easy leveling. Ability to add additional material with the excess material. Easily grader mounting and transportation options. The excavator bucket can pickup the grader for quickly moving. As an additional laser and / or ultrasound control or even bank angle sensor, the laser control system from Gritzke Lasertechnik OHG is the perfect complement to the GR01 grader.